So said Conservative prime minister, the Right Hon. Richard Bedford Bennett, his sharp, dominating voice reverberating throughout the House of Commons (pictured, right, in June, 1940). James Shaver Woodsworth (1874-1942, pictured below) could not believe his ears. The Labour member for Winnipeg North Centre had just requested leave of the House to introduce a bill to strike what was then §98 of the Criminal Code. In the 65-years of the House of Commons, no member had ever been prevented from introducing a bill: First Reading. Woodsworth was not at his first attempt at ridding Canada of §98, under which any organization which defended the use of force to bring about governmental change was an unlawful association. Attendance at a meeting of an unlawful association's meeting carried with it a presumption of membership. "... as a condition of continuing the license, all addresses should be in the English language, being the only language understood by the police officers." 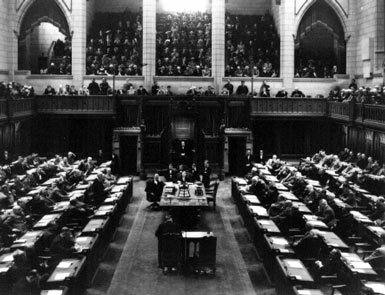 With this revelation, it was not long before Woodsworth had rallied French-Canadian Liberal members to his cause, but members who sat in shock just as Woodsworth did on that fateful day of February 22, 1932. The Speaker, as surprised by Bennett's tactics as any member, had little choice but to call in the members. ERNEST LAPOINTE (Quebec East): Does the right hon. gentleman prevent a member from introducing a bill? JAMES GARDINER (Melville): We do not know what the bill is about. The honurable member who introduced it has not been asked to explain. This is an extraordinary procedure and I protest against it. How can we vote on whether or not a member shall have the privilege of introducing a bill unless we know the contents of that bill? THE SPEAKER - George Black (Yukon): Perhaps it might be reasonable to permit the honourable member to make an explanation of this bill? RIGHT HON. RICHARD B. BENNETT - Prime Minister (Calgary South): He did not see fit to make any explanation. AN HON. MEMBER: He did not have a chance! MR. BENNETT: He asked for leave to introduce and he had as good a chance as any honourable member of this House has ever had. 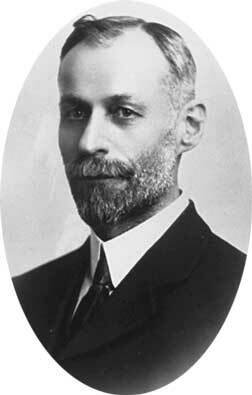 JAMES S. WOODSWORTH (Winnipeg North Centre): Mr. Speaker, I had no opportunity to explain my bill. The practice is that an honourable member is asked to explain. MR. BENNETT: But he is not bound to. MR. WOODSWORTH: He is not bound to?! Only a moment elapsed and to my utter astonishment the Prime Minister took an attitude which I have never known to be taken in the eleven years I have been in this House. I do not know whether or not the Prime Minister means that I as a member of the Labour party am never to have a chance to introduce any bill in this House?! MR. SPEAKER: I think it would be reasonable to allow the hon. member an opportunity now to make the usual brief explanation of his bill. MR. BENNETT: It can be done only with the unanimous consent of the House as it is a question of precedent, but I do not object. MR. LAPOINTE: I, for one, protest against this new procedure of having to submit any bill to my right hon. friend before it is introduced. MR. LAPOINTE: Mussolini is but a child! MR. SPEAKER: If the hon. member desires to proceed to explain his bill he will do so without delay. MR. WOODSWORTH: Mr. Speaker, this bill contains an amendment to §98 of the Criminal Code which concerns seditious and unlawful assemblies. The terms of the act are so broad as to permit its use for restricting of the legitimate activities of organized labour. A man may be considered to belong to an unlawful association unless he is able to produce proof to the contrary. Most of us have been of the opinion that a man was presumed innocent until proved guilty, but according to the law as it now stands, he is presumed to be guilty until he can prove himself innocent. That is obviously against all the ideas of British justice. MR. BENNETT: Mr. Speaker, I should like to point out that the hon. gentleman is in error when he states that lawful assemblies are in any sense prohibited or restricted. MR. WOODSWORTH: Mr. Speaker, I claim the right to debate this now! MR. LAPOINTE: This should be discussed on the Second Reading of the bill. MR. BENNETT: There will be no Second Reading. James Woodsworth pleaded with Speaker Black for the opportunity to continue and respond to Bennett's statement. But Black calmly told the member that "fair play" had been extended to him. He then ordered the members in to be counted. Bennett had his way and history was made at the expense of organized labour. First Reading was denied Woodsworth's bill, by a 72-49 vote.